What is Sangeetha's Damage protection plan? 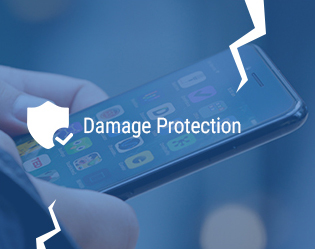 With Sangeetha's damage protection plan, if your phone is broken or has undergone any sort of physical damage, you can buy a new phone at half the price. This is free for 30 days and applicable to all Sangeetha customers. If you want to protect your phone for more than 30 days, you will have to pay a nominal price to protect your phone from physical damages. What to do with your damaged phone? Customers will have to submit the damaged mobile phone at any of the Sangeetha stores. Along with the phone customer will also have to submit the accessories and BOX with IMEI stickers. How do you get new phone? Customer will have to pay 50% value of the handset value as per the invoice to get new phone. GST charges are applicable for replacement of new phone. Which model can you buy? Customers can only buy the same model and same color of the phone bought prior to this. When and where do damage claim approvals happen? All physical damage approvals will happen across counters on working days. While Sundays and other holiday, approval will take 24 hours. Step 1: Customer logs in to Servify App or Servify Consumer Portal and raises a screen damage claim. Step 3: Customer can now schedule a pickup request for their damaged iPhone or Customer can select the nearest ASP to submit their iPhone for repair. Step 4: iPhone will be repaired within specified TAT and customer will be notified of every stage change. Step 5: Repaired unit is delivered to Customer. Get real-time repair status update - Once your request has been confirmed, you will be able to track your request with the Reference ID provided during claim request confirmation. Once your phone is repaired you need to return the temporary replacement iPhone. After the estimation of the repair, you will have to make a payment of a nominal amount as a mandatory admin fee, This payment can be made online. At the end of your service, you will be asked to rate the experience of the service you received with your iPhone screen replacement.